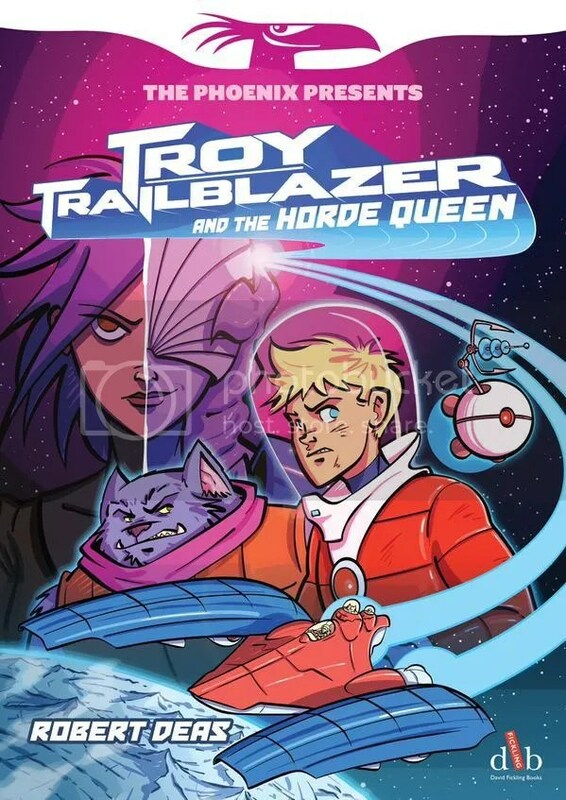 Troy Trailblazer is a young space adventurer. Aided by Blip, his probability-obsessed droid sidekick, Barrus, his near silent alien muscle and Jessica Jetrider, a reformed bounty hunter, Troy fights for justice, the oppressed and anything that sounds fun. First off, you really should be reading The Phoenix. It’s become not just an immensely successful champion for all-ages comics but a rally point for some of the best new talent working in comics. Plus, if you like 2000AD? Then you’ll like The Phoenix. There’s the same slightly punky sense of invention but with, a lot of the time, sense of wonder replacing the knowing satire. It’s flat out one of the best things being published in the field and it’s a huge pleasure to see their trade program collecting gems like this. If you liked Guardians of the Galaxy you’ll like this. If you liked Guardians of the Galaxy and thought Gamora got a crappy deal, you will LOVE this. Deas takes similar SF tropes (Hero who isn’t quite as good as he thinks he is, chirpy robo sidekick, grumpy strong guy, very competent and tough heroine) and takes them down a complimentary but different path. There’s no good natured Chris Pratt-powered slobbery here but rather a kid who has the best job in the universe getting by on charm, luck and the competency of his friends. A lesser writer wouldn’t be able to make Troy remotely sympathetic but Deas nails it, making him a charmingly self aware and still endearingly rubbish lead. The first chapter here in particular is really good, slightly knockabout kids’ science fiction with lots of action, lots of impact and some wonderful, fast paced art. Then the second chapter hits and you realize what’s really going on. It’s one of those annoying moments where I can’t tell you without spoiling it but there are some really nicely handled beats in that second chapter that give the story, if not a darker turn, then certainly a more mature edge. Every single moment of incident in the first chapter, including the one or two that feel just a little forced, pay off immensely in a smartly realized sting that makes both Troy, and Jess, into even more interesting characters. This is science fiction that knows its sources and influences and does new and interesting things with them, leading to a really fun, snappy read. But the real fun here is in the cutaways. An opening breakdown of Troy’s ship is fun, but it’s Blip’s autopsy of a wonderfully nasty alien that stays with you. Deas uses the cutaways to give you a lot of information in a small space and they’re indicative of how versatile his script is. Flashbacks, montages, cutaways and character redesigns are all used to tell the story and they all work perfectly. The end result is a fun, big-hearted and clever piece of science fiction that deserves a place on any fan’s shelf. Oh and the best Alien joke you’ll see this year. Hugely fun stuff.